Most innocents who drive to the supermarket for maple syrup return with a bottle of that looks as if it contained true syrup made from boiling down the sap from a sugar maple tree. But more often than not, the smaller print on the bottle says “maple flavored syrup” or “pancake syrup” which contains, at best, a mixture of maple syrup and something else — most likely high fructose corn syrup. Whatever it is, the syrup is dark, has a maple flavor and pours nicely on waffles and pancakes. But if you tap your own tree and boil down the sap, you’ll discover the taste of true maple syrup. You’ll produce a range of colors and you may decide — it’s a matter of taste, of course — that a light golden syrup has a taste even finer than an amber or topaz color. 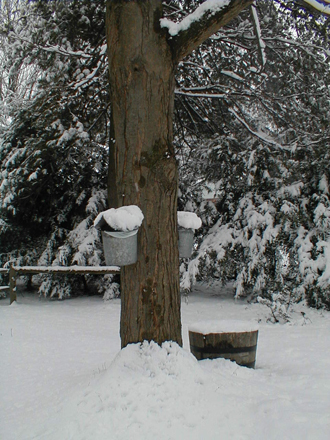 The classic image of a maple tap is of a sugar maple with a bucket hanging from a hook beneath a tap. And some people still do it that way and, in fact, enjoy it that way. Big producers in the North East — Maine, New Hampshire, Vermont, upstate New York — run yards and yards of plastic hoses from the tap to a holding tank; it’s not a bucolic scene, it’s industrial, far more efficient and the financial payoff is far greater. Sap begins to flow as winter ends and spring begins. Snow can be an inch deep or a foot and a half. Trudging through the snow to gather sap, one bucketful at a time, and pouring those buckets into a larger barrel on a sledge, and then dragging that sledge out of the woods, is hard work. It used to be done that way, but most anyone with an acre or more of sugar bush will want to use plastic hoses. On the other hand, if you have only a few sugar maples, or only a solitary one in your suburban plot, you do it by the bucket. It’s a springtime ritual; there’s snow on the ground at the beginning but, by the time the sap stops flowing, the snow has often melted away. Sap flows in any tree, but what we’re after here is a sugar maple. Most people recognize a maple leaf and there are many kinds of maple trees; the sugar maple has bark that clothes the tree in rather flat plates vertical plates. If the tree is at least 10 or 12 inches in diameter, you can make one tap hole, and you can make another tap for every additional 8 inches in diameter. Drill a hole at a convenient height and go in about 2 or 3 inches, using a 7/16 inch bit. Next you put in your spout, called a spile, and hang a bucket to catch the sap that drips out. You could use any old piece of pipe, but you’ll probably be happier if you buy a few spiles from a sugaring supplier. And while you’re at it, you can buy a sap bucket with a cover to keep out falling rain or snow. Maple sap is as clear and easy flowing as water, and if you take a small sip you’ll have to pay attention to taste a very faint, evanescent, almost-not-there sweetness. 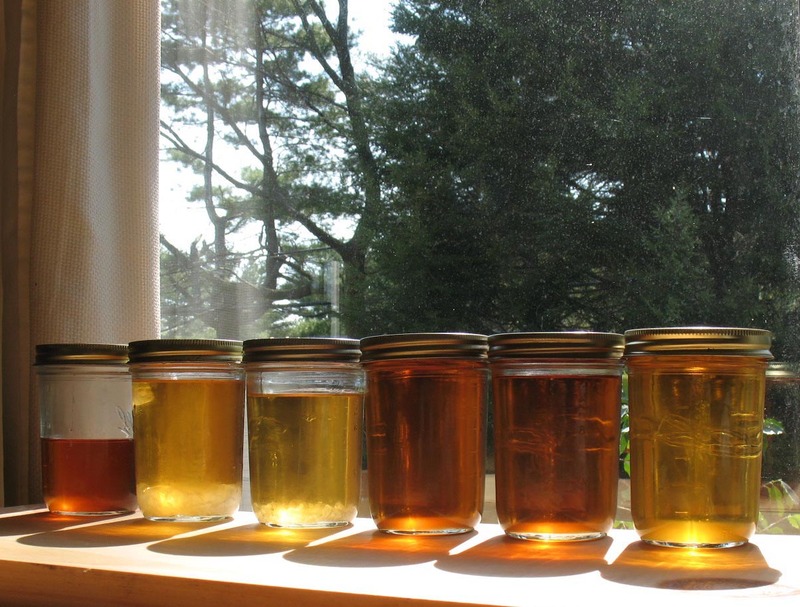 It takes forty measures of sap to make one measure of syrup. To do this with a bucket on a tree and the biggest pot you own on the stove requires time, strength and patience. Most individual producers are driven by a love of the process, or ritual, and not by profit. Those are the people who sell their maple syrup at farmers’ markets, and it’s probably the best you can get. 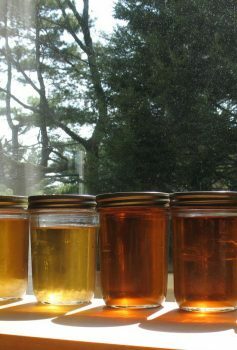 There may be science for the industrial producers with their plastic hoses, but for small farmers there’s a world of lore and legend around the making of maple syrup — when to begin, how to tell in advance what kind of season it will be, how fast the flow comes, how soon it will end, where to place your tap, and on and on. Yes, it does get boring and there’s something disheartening about adding a fresh bucket of colorless sap to the pot on the stove just when you’ve boiled down to a color which is finally beginning to look like syrup. Furthermore, as you boil down the sap and begin to get a syrupy liquid the boiling process gets tricky. You need to keep an eye on a candy thermometer, or have a fine sense of when to turn off the heat or remove the pot, otherwise there will come a sudden rising of foamy syrup and the odor of something burnt. On the other hand, the long boiling process humidifies the over-dry house and spreads a delicious aroma throughout the kitchen and beyond, and provides you with syrup of magical color and taste.